Juana and Augurio met in Lima, Peru in the 70s. They were friends, but it was Juana’s special blend of extreme optimism coupled with her practical, down-to-earth nature that caught Augurio’s eye. “She was so positive, but not one of those women you throw money at to impress. On a date, I offered to get us a taxi, but she said she was fine taking the bus. There was something different about her, about how she saw things in the world.” Augurio says that it is Juana’s optimism that drives her to make ambitious plans, while he tends to be a more cautious decision-maker, focusing more on the finance and the risks. Once the decision was made, each pushed the other towards success. Juana is more comfortable in English, but introverted, whereas Augurio is gregarious, but struggled with comprehension. 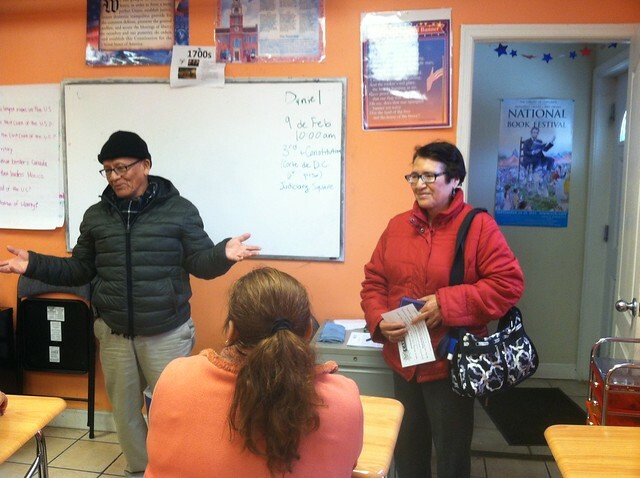 Juana’s boss helped her find CARECEN’s citizenship classes, and they enrolled in two sessions of class to prepare for the exam. After turning in their applications, they began to focus even more on their English, and traded relaxing weekends for study dates. Juana would book a room at the Mt. Pleasant library, and the couple would spend the day dictating sentences to each other to improve their written English, and watching YouTube videos of interview simulations to improve their comprehension. In January, their hard work paid off. Juana said, “The officer finished the interview and said ‘Congratulations’. That is what you wait for, after all that studying. To hear the official say that word is an incredible moment.” While Augurio’s interview was first, his naturalization ceremony was cancelled due to a blizzard, and Juana became the first of the pair to be sworn in as a U.S. citizen. Augurio teased her, saying “You tricked me! I thought we were doing this together, but you beat me to it!” Just days later, Augurio was sworn in as well. In the 10 years that remain until their Golden Anniversary, the couple hopes to vote in upcoming elections elections, travel, enjoy their grandchildren and great-grandchildren, and continue to reunite their family through petitions. 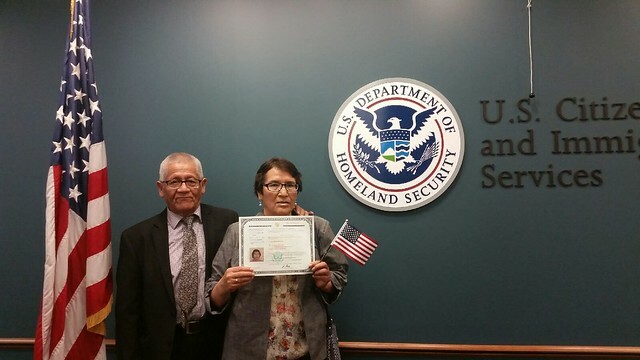 They aren’t sure what adventures lay ahead, but are excited to share their next 10 years as naturalized U.S. citizens. 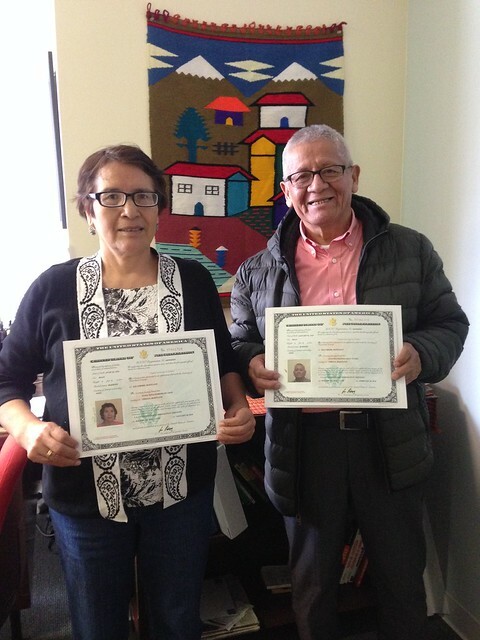 Congratulations to Juana, Augurio, and all of our newly naturalized citizens, and Happy Valentine’s Day!